Stay tuned for details coming Spring 2019. Join TEAM TSO and help us reach our fundraising goal of $25,000. Funds raised will support the Toronto Symphony Orchestra and its education programs, and the Toronto Symphony Youth Orchestra’s tuition-free enrollment. Recruit family members, friends, colleagues, and other music lovers like you for this fun and rewarding event. Whether you walk a little or run a lot, we want YOU on TEAM TSO. The event includes a 5K, a half marathon (21K) or a full marathon (42K). The 5K event also allows walking/running with a baby stroller as well as children under the age of 12. The event is open to all – you do not need to be a member of the Toronto Symphony Volunteer Committee (TSVC) to participate. To register, please visit the 2018 STWM Scotiabank Charity Challenge webpage for TEAM TSO – CLICK HERE. Registration is available online until October 15, 2018 at midnight (if race caps have not been reached). If you are unable to register before online registration closes, you can register in person at the race Expo (if race caps have not been reached). From this webpage you can click to register/fundraise, sign in to your fundraising page (if you have already registered), or make a donation. REGISTRATION DISCOUNT – Please contact Linda McGeown at lmcgeown@TSO.CA to receive the discount charity pin code prior to registering. Charity Rates: 5k $40 │ 5k with baby stroller $50 │ Half Marathon (21k) and Marathon (42k) $80. Plus applicable taxes and processing fee. Print/download 2018 STWM Scotiabank Charity Challenge Participant Registration Guide. Once you have registered and created your fundraising page, you can use your page to set your goal, track your progress, and invite your family, friends and colleagues to sponsor you. All online pledges/donations will receive an electronic tax receipt. The Offline Pledge Form can also be used by participants and sponsors/donors as an alternative to online pledges/donations. Print/download 2018 TEAM TSO – Paper Pledge Form (for Offline Donations). Trouble registering online? Would you like us to register you? If so, please contact us (see contact information below). Either online via a credit card. To sponsor a participant or team – CLICK HERE. To make a donation – CLICK HERE. 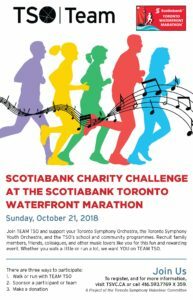 Or by completing the 2018 TEAM TSO – Paper Pledge Form (for Offline Donations) and submitting it with your payment (cash/cheque) to the Toronto Symphony Volunteer Committee, 500-145 Wellington St. W., Toronto, ON M5J 1H8, Attn: Linda McGeown. Cheques should be made payable to: Toronto Symphony Volunteer Committee. Please do not send cash by mail. You can also ask your friends, neighbours, doctors, dentist, hairdresser, etc. to sponsor a participant or team or to donate to our event. Every dollar counts! All pledges/donations will receive an official tax receipt (either electronically for online donations or by mail for offline donations). For additional information or assistance with registration, please contact Linda McGeown at lmcgeown@TSO.CA or call 416.593.7769 X 359.